In many cases, bots respond to user requests synchronously; synchronous response payloads can be sent by the bot application directly without using the Hangouts Chat API. However, some cases require out-of-band messages. For example, a bot might want to notify users asynchronously after a long-running background job they requested has completed. A bot needs to use the Hangouts Chat API to send out-of-band messages to Hangouts Chat. Bots use service accounts to access Google APIs; in most cases a bot needs service account to use the Hangouts Chat API. This guide explains how to set up and use a service account for your bot. Python is used in the sample, but this can be implemented in any language supported by our API Client Libraries. A service account acts as the bot's own identity when accessing protected resources and methods. This means that bots act like special Google users: they have their own ID, they authenticate using their own credentials, and make calls to Hangouts Chat with their own level of authorization. The remaining sections of this guide explain these steps in greater detail. To create a service account and private key, follow the steps below. You may also want to refer to the detailed Cloud documentation on this topic. This is the only copy of the key. Do not lose it! Next, you need to apply necessary credential headers to all requests made by an httplib2.Http instance. The documentation on service accounts shows an example of this, and of then calling a Google API using a service account. The following table lists the (only) available scope for Hangouts Chat bots. 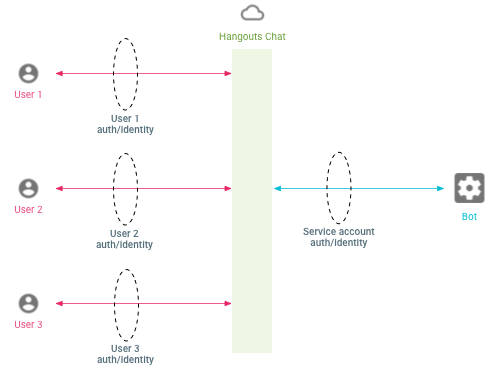 Bots must pass the selected scope(s) when authenticating to the Hangouts Chat API. This scope only works for service accounts—you can't use this scope to authenticate using end-user credentials. https://www.googleapis.com/auth/chat.bot Allows bots to view chats and send messages. The following code snippet shows how to create a credential object, using a private key like the one created in step 1. You'll need to use a client library to call the Hangouts Chat API. As mentioned above, we're using the Google APIs Client Library for Python in this example, but you can use any language supported by our client libraries. Here's a code snippet that creates a service endpoint to the Hangouts Chat API. The calls must be authorized, so we create a new HTTP client Http() and authorize/sign it with the service account credentials. This is passed, along with the API name and version, as the communication mechanism for talking to the API. When is a service account needed? Although some bots need to use service accounts, some may not. See the table below for guidance.